"Awesome meatballs! I buy my frozen cocktail meatballs at Costco®." Combine grape jelly, chili sauce, and cayenne pepper in a saucepan over medium-high heat; cook until warm, 5 to 10 minutes. 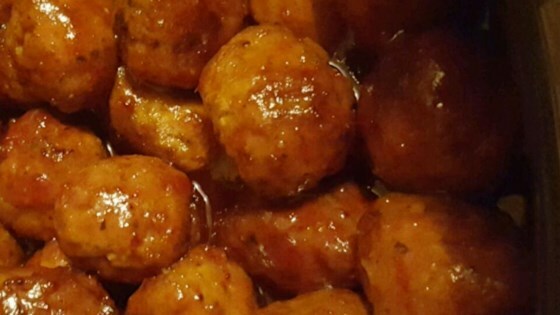 Place meatballs in a slow cooker and top with grape jelly mixture. Cook on Low for 3 to 4 hours. Savory and sweet meatball appetizers. The chili sauce is by the ketchup at the grocery store. Awesome recipe for entertaining. So simple & very crowd pleasing! these were good. I used 1/2 jar grape jelly, one bottle of chili sauce and one back of regular meatballs. Will make again next time i have a party.